← Roden Boeing 720B has arrived! Airlinehobby.com has released two new aviatiopn DVDs, and both are in stock. AHC-062 features action at Yellowknife, featuring, in Henry’s words “…Air Tindi, Ptarmigan Airways, First Air, NWT Air, Canadian North, Conair and Buffalo Airways. You’ll see winter, spring, summer and fall operations, including everything from Beavers to Boeings, wheels to floats to skis, airport to float base to water bombers”. And, again as Henry so eloquently says, “something for everyone, except the “Ice Pilots NWT” drama! AHS-063 c ontinues the action in Canada’s far north focusing on the NWT Air Boeing 737-200 fleet, and operations from Yellowknife in the Northwest Territories. 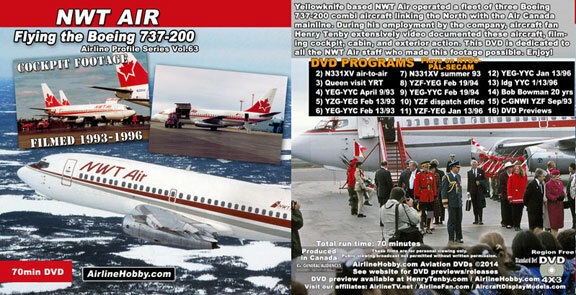 This entry was posted in New DVD and tagged NWT Air, NWT Air Boeing, Yellowknife. Bookmark the permalink.